No Way Back is not a festival, it is not an event - it is a party. After the overwhelming success that followed moving 2015's Detroit edition of No Way Back from 1515 to Tangent Gallery, we felt the need to spread our wings a bit in Brooklyn as well, so we're moving from Trans Pecos to the recently reopened Market Hotel. If you don't understand the touchstones of this party, it might be impossible to explain. It is a comment on a continuum. For many of us it began the 90s, searching through fliers at Record Time, calling info lines and buying your ticket at Zoot's only to get lost trying to find that elusive warehouse. What was inside? Something amazing... This is our generation returning to the source, feeling a freedom and a heat within the music that resulted in speaker freaking. Every DJ chosen to play at No Way Back is a master of their medium, so deep in it that they all serve as constant inspirations. This is a celebration of the lost art of the late night Midwestern DJ. This is what makes the collaboration between Interdimensional Transmissions and The Bunker so effortless, as they both are champions of this, with The Bunker residents like Derek Plaslaiko, Mike Servito and Bryan Kasenic being long time IT collaborators. There are tens of thousands of others who caught on to Plaslaiko following his record-breaking 12-hour Boiler Room set, where he gave viewers a look into his living room, while friends and friend’s toddlers enjoyed the day. This landmark session properly archived the full Plaslaiko musical experience, from flawless house and techno, to hip-hop, classic rock, and whatever other musical moment this life-long record obsessive chooses to share. And let’s not forget the thousands of folks who have befriended Plaslaiko while sharing the dance floor with this committed clubber who refuses to hang out in the booth and will always skip the DJ dinner in favor of catching one of his peers behind the decks. Patrick Russell is a true veteran of the underground, perhaps one of the last unsung heroes of a now lost era in the Midwest. He magically transforms the diaspora of pure jack energy into a fluent sonic dialog that never fails to devastate the dance floor. A Detroit-bred DJ, artist and producer since the early 90's, Patrick has now made Brooklyn his home. His resume highlights include everything from an exclusive opening for Jeff Mills in Detroit in 2007, performing at the 2001 & 2008 DEMF/Movement festivals, to decorating and performing at the inaugural and now legendary leaky warehouse No Way Back. His consummate taste and ecstatic yet disciplined execution have created a respect that cannot be purchased. Patrick is not just one to watch, he is one to be experienced. Patrick has an EP dropping on The Bunker New York soon! For the past 13 years, The Bunker New York has led the way for American techno by bringing together hundreds of artists from all over the world. 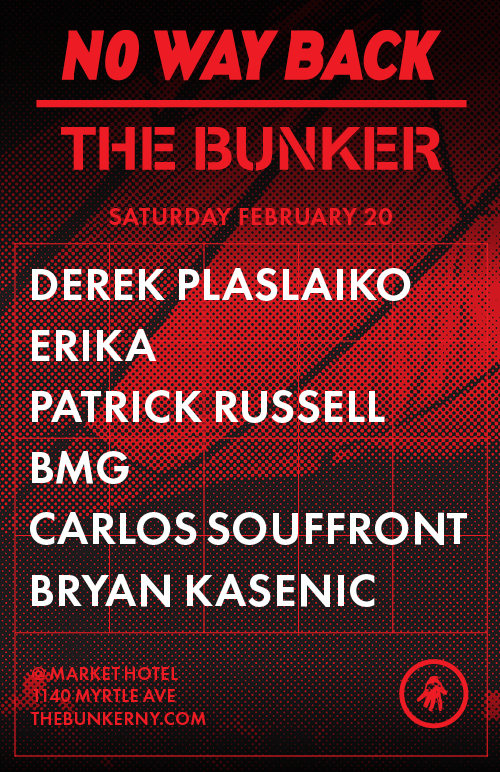 More than a mere techno party, The Bunker unites diverse sounds from across the electronic music spectrum, connecting the dots between house, techno, experimental sounds, and much more. The Bunker New York began as a party, grew up into a record label, and has become a collaborative community, fostered by founder and curator Bryan Kasenic since its launch in 2003. Kasenic's roots in the world of music go deep. In 1993, at the age of 16, he began DJing on Carnegie Mellon’s WRCT in Pittsburgh. He went on to launch his own radio show on WNYU in 1997. The radio show, and his interest in the many weird corners of the NYC music scene, eventually morphed into the creation of a weekly email newsletter, which included noteworthy party and event listings at a time when nothing of the kind existed online. As Bryan became more established in New York City, he created Beyond Booking, the agency that would become a core part of The Bunker New York. During this time, Bryan was also a sought-after DJ, performing at parties and events on a weekly basis. Currently, Bryan also hosts a weekly show on Red Bull Music Academy Radio, featuring The Bunker's friends and family. Bryan is much more than a mainstay at The Bunker New York. He has also played in many of the finest clubs and venues around the world: Berghain, Panorama Bar, and Atonal Festival in Berlin; Output, Verboten, and MoMA PS1's Warm Up series in New York; Air Tokyo and Circus Osaka in Japan; Smart Bar in Chicago; the Communikey and Decibel festivals in Boulder and Seattle respectively; Public Works in San Francisco; and many more. Additionally, he has co-produced numerous events and festivals, including several years at Unsound Festival New York. Unsound is one of the leading electronic and experimental music festivals worldwide, and he subsequently brought The Bunker to Krakow, Poland, Unsound's native city. To understand Kasenic as a DJ one needs only look back at his decades of passion promoting electronic and experimental sounds in New York, and towards the sound of the artists that have become key members of The Bunker New York family: the psychedelic, cerebral bent of Atom™, Voices From The Lake, and Reagenz; the swirling, atmospheric soundscapes of Clay Wilson, Zemi17, and Marco Shuttle; and the industrial-strength hardware dynamics of Løt.te, Mark Verbos, and Romans. 12 years after its founding, The Bunker is stronger than it has ever been and continues to grow, thanks to Kasenic's vision and effort.